Flossing is an integral part of our daily dental routine (or at least it should be). The importance of keeping our teeth healthy can’t be overemphasized if you wish to have all your teeth intact well into your 60’s. Despite the advantages flossing brings, such as preventing gum diseases, many people still forego this seemingly crucial and easy procedure. Why? Because sometimes it hurts. Let’s find out why, and how to overcome this barrier. It can be done with a water flosser or a variety of string flossers. 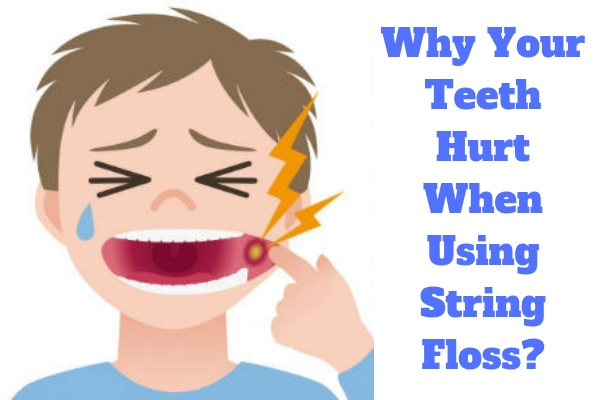 Why Do Teeth Hurt After Flossing? While flossing with a string you’re continuously squeezing a foreign object back & forth on a sensitive area such as your gums. The friction that results from this movement often times hurts the gums. String flossing is generally an abrasive activity. You’re basically cutting and scraping to strip bacterial growth & minor infections away from the enamel & pulp of your tooth. It’s almost like taking a knife to your gums. If you’re not used to regular flossing. The pain is expected to reduce with regular practice. If there are underlying issues with your gums and teeth like gum diseases such as gingivitis. This could require help from your dentist. If there’s a tooth decaying. If you have food stuck between your teeth. An important consideration is whether you’re using the correct technique. Incorrect flossing can damage your gums while careless flossing will damage gums, teeth, and dental work. Below is the correct technique to hopefully make it a pain-free process. Check if your gums are red and inflamed before flossing. If you do you may need your dentist’s help first. Determine if your teeth feel sensitive or painful when you drink or eat. Treat this before it gets worse. Apply a desensitizing toothpaste or fluoride gel. Don’t floss too hard or fast; Be gentle. If using the traditional methods of flossing cause you great discomfort you can always opt for a non-intrusive approach—water flossing. This method incorporates a handheld device known as a water flosser (waterpick) or oral pulsating irrigator. It aims a steady stream of water at your teeth. This method will also help remove food particles while limiting pain when compared to traditional flossing. What is your next step? Improving your flossing or visiting your dentist? It’s best to find a way to incorporate flossing into your daily routine to maintain that healthy and beautiful smile. Read More: Water flossing vs regular flossing – what is better?